Raleigh Tavern: Thomas Jefferson Slept Here | slate river ramblings . . . . In the early 19th century, Daniel Guerrant operated the Raleigh Tavern, located near Buckingham Court House. Among other notables, Thomas Jefferson enjoyed the table at the Raleigh and may even have slept there. Going to and from Monticello and his Bedford County home, Poplar Forest, Jefferson typically crossed the James River at Warren Ferry. On several trips, he noted that he stopped at the Raleigh for corn or oats, presumably for his horse. Sometimes, he stayed for breakfast. 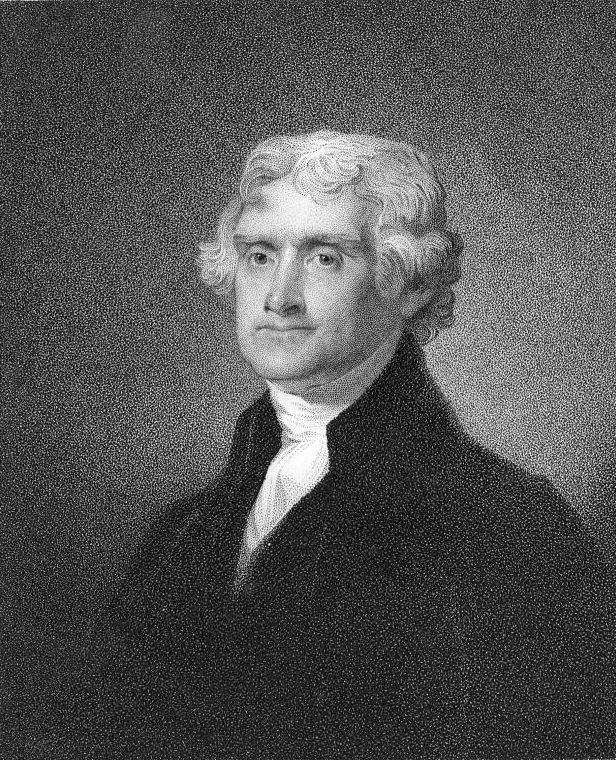 Jefferson’s bill for dining at the Raleigh varied from $1.00 to $1.96 to a whopping $2.33. In 1815, Thomas may have stayed the night at the Raleigh when he appeared at Buckingham Courthouse to defend the first will of his brother, Randolph Jefferson. On September 12th, he tipped the Raleigh staff $.25. According to legend, in 1811, Daniel Guerrant’s tavern and stage stop was elaborated into what became known as Rose Cottage. Located on Route 690, the original building was expanded by Robert Shaw and, later, owned by William P. Shepherd. Daniel Guerrant paid for an ordinary license in 1805 and not again until 1811. In the gap between 1805 and 1811, did Guerrant close his old building and open a new Raleigh Tavern in 1811, selling the old structure to Robert Shaw? If any Slate River Ramblings readers know more about Daniel Guerrant and his tavern(s), please comment. We now own what we have been told is the Raleigh Tavern. It looks like Rose Cottage from the drawings. It was rebuilt in 1985 in Hanover Co and added onto in 2004. Rose Cottage at Lee Wayside (which may have been called the Raleigh Tavern early in its existence) was struck by lightning and burned to the ground in 1985. The building called Raleigh west of the courthouse at the intersection of Rt. 60 & Rt. 56 was torn down around 1980 by Lewis Ramsey. I have been told that he used the materials from Raleigh to build a house at Manteo in Buckingham County. Perhaps he used the materials to build a house in Hanover as well. interesting. My place was constructed in 1985 and I believe that it had been in pieces for some time before being sold to Bill Westbrook (advertising agent now living in Chicago). I also understand that it was close to the Buckingham courthouse. He had it reconstructed on this site overlooking Stagg Creek. There are no burn marks on the internal structure which is in good condition, including the floors. The building is 3 stories and includes original beams, floors and walls. I’d like to send you a photo but not sure how to. I don’t have a picture of the original Raleigh, but the drawings of the Rose Cottage is very similar to the Tavern that we own. Does anyone have one so I can compare? There was absolutely nothing left of Rose Cottage after it burned except the brick chimneys–so your home could not have been built with materials from Rose Cottage. Please send your email address to me at Buckinghamelections@embarqmail.com and I will send you info. My research has it that Raleigh (west of the Courthouse) is about where SR56 comes into US60( on the south side of US60). That intersection is called Denton’s Corner. There are, of course, no buildings there now, but there is a stand of trees, and hidden within them is a small cemetery. The Denton Family lived on the north side of US60, and had their family buried in a family cemetery on their farm, so it is assumed that there are no Dentons in “Raleigh cemetery”. There are no tombstones in the cemetery at the Raleigh site, but there are the remains of a stone wall. Thanks, Lynn for adding to the conversation! Margaret, Many thanks! Do you think that Daniel Guerrant owned both? And, do you know how he was connected to “Staples and Guerrant” which had an ordinary license for at least one year during this period? Joanne. There is some information in The Courthouse Burned (pages 28 and 71), plus some other info in the museum. I will try to make a visit to the museum soon. I think Guerrant was connected with the Raleigh west of the Courthouse only, but I could be wrong. I’ve consulted my copy of The Courthouse Burned and have a growing suspicion that stories about the Raleigh and the two buildings have been conflated. Easy to do. Two places, fairly close together with the same name. Robert Shaw was owner of one and William Shaw was the owner of the other? The references above to breakfasts at the Raleigh come from Jefferson’s Memorandum Books. There were two early buildings in Buckingham called “Raleigh.” One was on Route 690 (Lee Wayside Rd.) east of Buckingham Courthouse, and the other was on Route 60 west of Buckingham Courthouse. The two are often confused. Local lore is that Jefferson overnighted at the Raleigh west of Buckingham Courthouse on Route 60. Margaret, was the “West” Raleigh the one owned by Guerrant? My notes of the land records for the County only were tracing Wm P Shepherd, so I don’t know what Robert Shaw’s property (363 acres on the N.Canton Road, presumably 60 E of the Courthouse) contained before it was conveyed to Wm. P. The tax records of the time for real property did not differentiate between land and “improvements” and buildings, as far as I can tell. Daniel Guerrant’s Tavern | slate river ramblings . . . .